At Soirée, we love kids! Really! But, we are starting to see a trend towards adult-only receptions. We have seen many couples struggle with this decision in the past. It can be challenging to decide what type of environment you want at your reception. We hope to help anyone who is struggling with this decision and provide insight into how to go about informing your guests of your wishes. The very first thing we recommend before making this decision is to envision your wedding day. What are the factors that are most important to the success of your wedding day? What type of vibe do you want to have at your reception? What will bring you the most joy, and how will you achieve that? If you envision a family-oriented wedding day with guests of all ages to help you celebrate, you might lean towards a kid-friendly reception. If you want a more formal, late-night wedding reception, you might consider an adults-only reception. Kids are the cutest at weddings. There is nothing like a sweet flower girl dropping flower petals down the aisle or the ring bearer in his cute little tux! If you are super family-oriented or have a lot of guests that have children, you might choose to have a kid-friendly wedding. If the invitation is open for children, moms and dads will be appreciative of this gesture. Babysitters can be hard to find and also expensive on a weekend, not to mention the extra planning if the wedding is out of town. Having a kid-friendly reception might allow more of your guests to be able to attend the event. When the DJ kicks up the music and all the kids are the first to join the dance floor, it’s totally entertaining for those adults watching those kids boogie down! 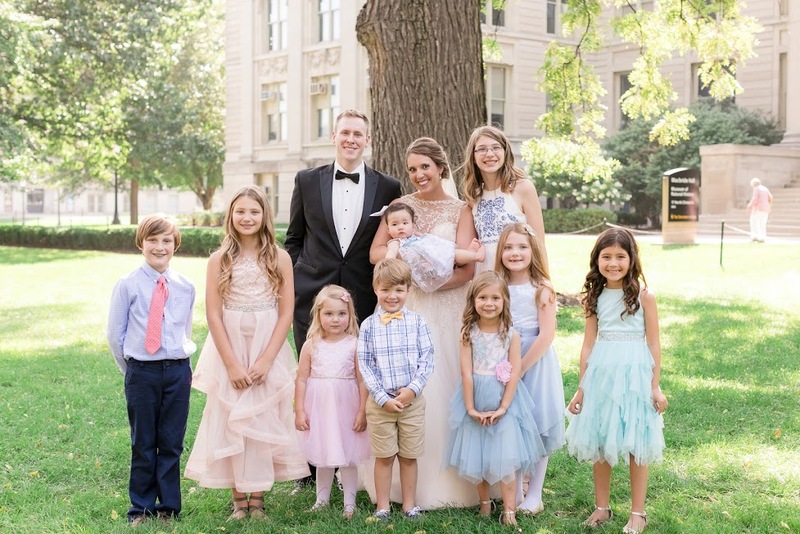 There are so many reasons to include the children at your wedding, and so we are seeing many of our couples keep their reception family-friendly. If you are choosing to invite the kids, it’s a great idea to make plans for those families. Will there be high chairs available? Are you going to offer a separate meal with child-friendly food? Kids tend to become uninterested in typical wedding reception activities and might become a little restless. It is a good idea to have alternative activities for children to participate in throughout the night. This will hopefully help keep both you and your guests sane. Some of these activities may be a scavenger hunt, board games, coloring, or a game of musical chairs — the possibilities are endless. Get those creative juices flowing! Many wedding guests view the reception as a big party, which can be difficult to manage when kids are involved. If you’re looking to have a more formal wedding or even just a late night reception with an open bar, kids might not be the best mix for your reception. Dealing with meltdowns and keeping vigilant watch over their every move might be hard to handle when trying to celebrate. Additionally, if your guest list is creeping higher than you’re comfortable with, having an adults-only reception might help you lower your numbers (thereby saving some in your overall budget too!). Plus, parents always need a night out away from their kids. A babysitter is an easy solution for couples who want to enjoy their night and relax without the responsibility of monitoring children all night. As parents of small children ourselves, we can appreciate a night out to celebrate. Guests don’t always pay attention to the specific names written on the front of the envelope. While the invitation is usually indicative of who and how many people are invited, it’s good to reinforce the idea in multiple places. 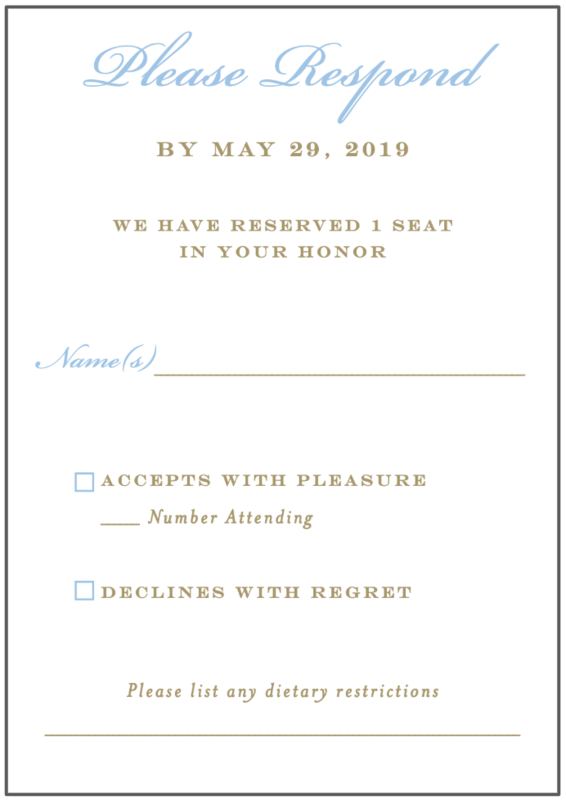 When creating RSVP cards, you can specify how many seats are reserved for that specific household, by using the phrase, “There have been 2 seats reserved in your honor.” For example, you would do this if you only want the guest and their spouse/date to attend. This way the couple knows that they need to make other arrangements for their children that day. It’s always helpful to be specific on your Information or Details card in the invitation suite with a direct message. “Respectfully, an Adults Only Occasion” works well. Or, something to the effect of “We love your kids but thought you’d like a night off. Adults only please!” will go a long way to ensuring that you’re communicating your wedding day wishes to your guests effectively. 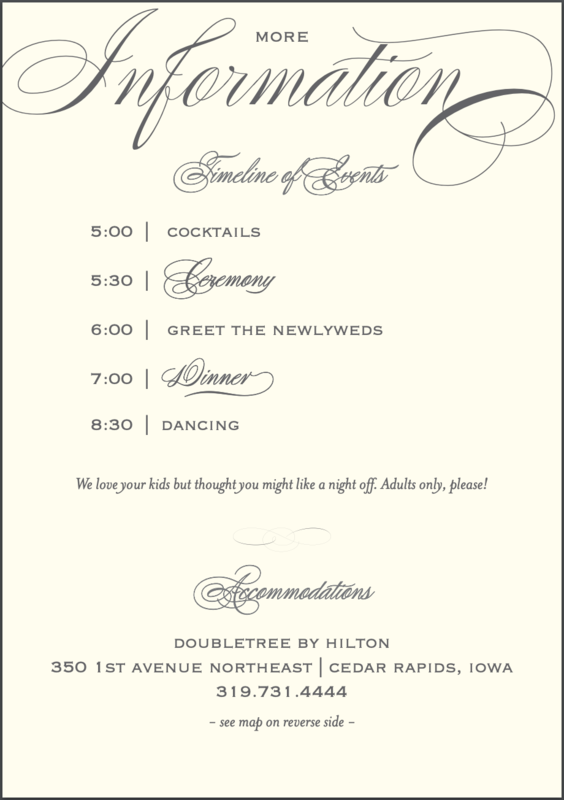 Hopefully, this has provided some insight into making the choice between an adults-only or kid-friendly wedding. We hope that whatever your choice, you have the most amazing time on your wedding day!